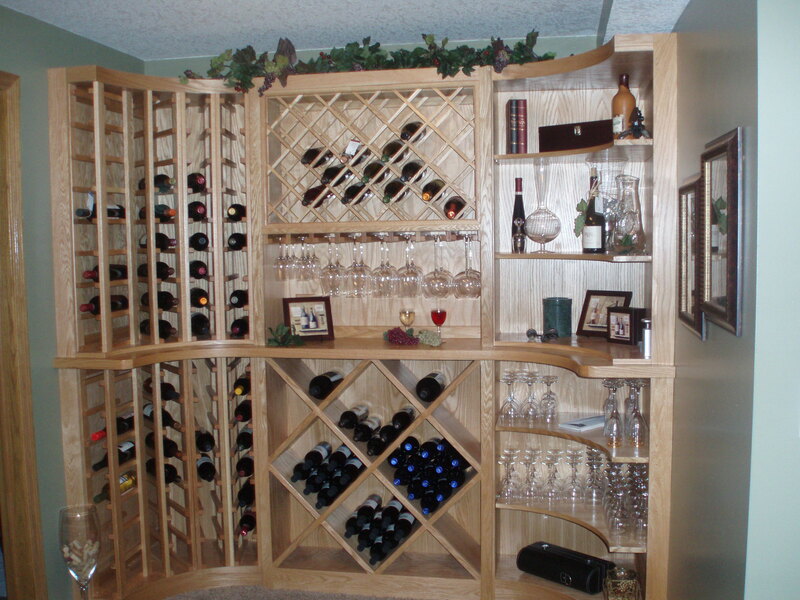 As I became more interested in wine and started collecting bottles, it was apparent I needed to have my wine cellar. 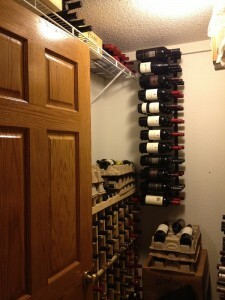 Besides, I had always really wanted a cooler or a cellar of some sort so this gave me a good reason. We have a great spot in the basement that was on the north side of the house with no visible windows. The nook sits directly below the front entry and had been used for various things over the years. It was once our work out area and then sat with a futon for friends to rest on if they may have had one too many to drive home after a social event. Our basement keeps a relative temperature of 65 to 68 degrees all year round. Temperature: Depending on the location of your home, you might need a cooler. 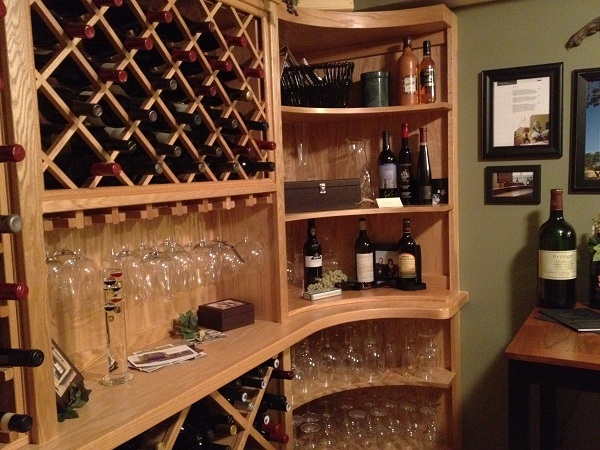 The cooler will help keep your wine at a constant temperature and keep the relative humidity constant. If the air is dry corks will dry out allowing air into the bottles. If you determine a cooler is necessary, you will need a dedicated non switchable electrical outlet. Coolers also need ventilation. Plan ahead and make sure you can route the ventilation outside. 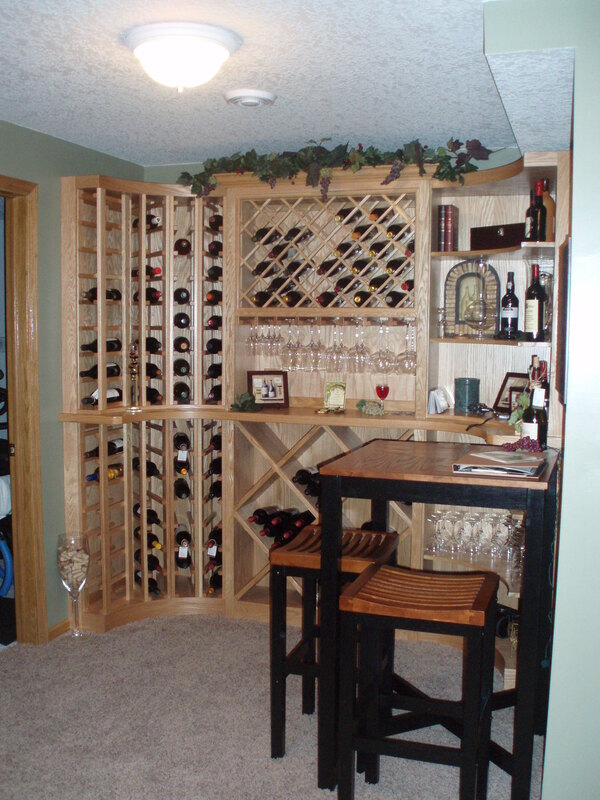 Location, location, location: Never build your cellar in the same room as your furnace! The heat and constant temperature change would be bad for wine! Vibrations: Choose a location which has a solid floor. Concrete is best. If you plan on holding your wine for a long time vibrations can disrupt the wine. Sunlight: Avoid it in your cellar! Direct sunlight ages the wine. This is one of the major reasons why reds are stored in dark wine bottles. Size: This is a case where size “does” matter. 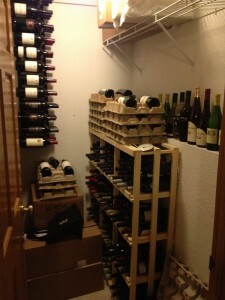 If you are planning for a 100 bottle cellar I would recommend doubling it. Trust me I made this mistake… and I’ll explain below. Bottle types: If you plan on buying magnums, make sure you account for this within your design. A slot for a 750mL is not big enough for a magnum. We had an idea of what we wanted so we called our friend Dean who is an excellent carpenter. 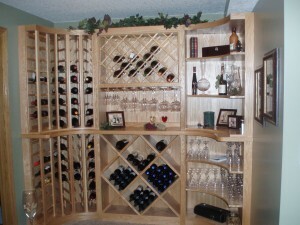 Dean had completed other cabinet work and for us and pays attention to detail. After the plans were drafted, we pulled the trigger and he got to work on the cellar. 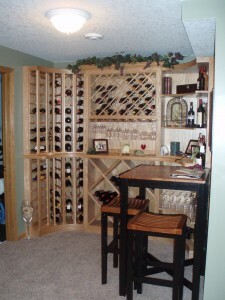 Not long after Dean was out installing the cellar and the project took a few hours to complete. Once done it was time to fill the rack! I was really anxious to get started and initially did not think about a racking game plan. As we were filling the rack, I started wondering how will we know what and where any given bottle is located? I needed to create a chart of the cellar and label each location. This way I would know the bottle of 1998 Verite was in location “A1”. I also needed to make sure my little darlings (Nick, Michelle, and Andrew) understood that I have a system in place and would know right away if they ever chose to help themselves. We believe in keeping the honest honest! Taking a bottle of Dads wine is a serious issue. 😉 Dad is the judge and juror so it would be a quick trial if the bottle was missing. We decided we would like a small table and a couple of chairs so that we could sit and sip the wines. 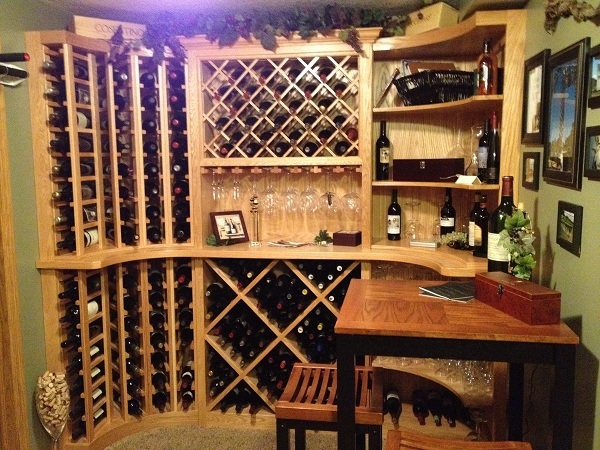 This is a great idea but honestly since our cellar is not big enough, we should have skipped that and may eventually build onto that area of the existing cellar. This is yet another reason you need to really think about what you want before you build. If you want to hang out in the cellar I would make it a 10 x 10 room, SERIOUSLY. I would have a tile or wood floor. No carpet because accidents and spilling is bound to happen. Remember I mentioned that you should double the amount of wine rack space? Well I thought my cellar would be large enough. Over time, both Chris and I purchased more gems than we anticipated. It didn’t take long and we ran out of room. It was time for some fast thinking. Next to the cellar is a bedroom that we converted into our home gym. The room includes a walk in closet with an ideal climate. After a couple of online purchases, we assembled and installed additional wine racks. It’s not perfect in looks, but does the job. Chris and I have both promised each other not to make any major purchases until we dwindle down our current inventory. We are doing our best and our friends are reaping the rewards of excellent wine that we’ve been sharing! However, our Napa/Sonoma friends are not helping!